A good deal of my formative cricket-watching took place in the nineties, and an England supporter needed one quality more than any other during this time: blind optimism. Blind optimism was how you managed to endure your favourite sport. You needed hope that there could be more to cricket than a slow, predictable slog to a long-foreseen conclusion, and more specifically, you needed hope that the opposition's 200 for 0 could become 250 all out. Waqar Younis gave me that hope. I first became aware of Waqar in 1991, in that most old-fashioned way - by looking in the paper. I was only 13 and I didn't exactly read the paper - I just looked at the scorecards and the averages. I always read the bowling averages from the bottom up, saving the best until last. The averages slowly descended by fractions of a run, then suddenly, right at the business end of the table, there was a massive drop. Attached to this ludicrously low bowling average was always the same exotic name: Waqar Younis (Surrey). Waqar took 113 Championship wickets at 14.36 that year, but I didn't see him play once, which only added to the sense of mystery. My team, Lancashire, had Wasim Akram. I'd seen him and he was awe-inspiring. What the hell could Waqar do that was even better? When Pakistan toured England in 1992, I found out. That series didn't start with a bang, largely because Waqar was only just returning to action following the small matter of a broken back. In the first Test, he was understandably cautious and the match was drawn. Pakistan won the second Test and he got a five-wicket haul, but it wasn't until the fourth Test, at Headingley, that he created the small shred of hope that was to falsely sustain me for the next ten years. England actually won the Test, but little things like that don't matter a jot. England were 270 for 1 in their first innings, already 73 ahead, when Aaqib Javed dismissed Robin Smith. At this point Pakistan unleashed Waqar, who had taken no wickets and conceded over a hundred runs. Bowling obscenely fast, he took 5 for 13 in 38 balls and England were all out for 320. Three batsmen were bowled and two unfortunates endured the not-uncommon physical pain of being dismissed lbw Waqar Younis. England had fielded a horses-for-courses attack of Chris Lewis, Neil Mallender, Derek Pringle and Tim Munton. Waqar came on first change. With just a cursory look, the most striking batting collapses are those when a whole side's been bowled out for double figures. What Waqar did was create batting collapses where none should have occurred. How many times during that largely miserable decade did I watch English seamers potter in under a clear blue sky and think to myself, "If we could get a quick seven wickets, we'd be right back in this"? Waqar Younis showed me that, actually, this wasn't a totally delusional line of thinking, and he therefore gave me the priceless gift of mindless optimism. Yet watching Mark Taylor, Michael Slater and David Boon all hit hundreds in the same innings before Mark Waugh "fails" with 99 does more than just create a desperate longing for a bowler who's at his best with the old ball on a dry day. It also creates a pretty deep-seated loathing of batsmen in general. If you've spent whole days watching them gambol about without a care in the world, waving their bats to the crowd with smiles plastered across their smug little faces, then you want to see them knocked down a peg or 40. You want to see their precious stumps spread from third man to fine leg, and you want them to be lying on the ground, not knowing what happened, with their dignity in tatters, when it happens. I don't enjoy seeing batsmen hurt, but the occasional broken toe was collateral damage in an ongoing war. International batsmen generally have half-decent balance, but the Waqar Younis inswinging yorker made fools of them all. Given a choice between losing their toes or losing their dignity, most batsmen opted for falling flat on their face, a position from where they could better hear their middle and leg stumps going their separate ways. Where Wasim was an expert lock pick with a wide array of tools at his disposal, Waqar just burst through doors with a battering ram so immense he could just as easily have gone through the wall. Wasim could do a million and one devious things with a cricket ball, but Waqar essentially just did one. And he only needed to do one. The Waqar Younis reverse-swinging yorker might just be the most destructive delivery in the history of cricket. Maybe all of this is painting him as one-dimensional, but it was that yorker that grabbed me when I finally got to see him bowl, and it was that yorker that largely explains his phenomenal ability to run through a batting order in the time it took a dismissed opening batsman to say, "Mind your toes." 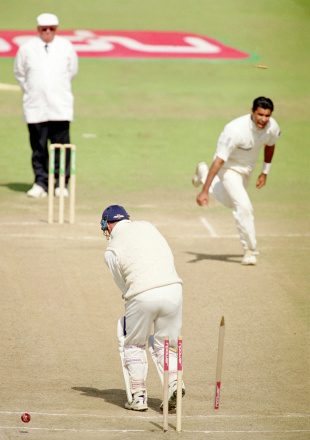 Delivered with a different, more round-arm action to the one he used when opening the bowling, it was a virtually unstoppable delivery, and one of Waqar's greatest strengths was that he acknowledged that fact and was perfectly happy to bowl it again and again and again, where other bowlers might have held it in reserve as a surprise weapon. It didn't need to be a surprise, because knowing what was coming simply didn't help the batsman all that much. Waqar Younis cemented my enduring love for bowlers over batsmen. When batsmen are on top, the game develops. When bowlers are on top, the game changes, and it only takes a handful of searing inswingers to turn a match. By applying such mindless optimism whenever England were getting the runaround in the field, I managed to watch far more cricket than I should have done and got hooked on a wonderful game that was trying its damnedest to drive me away.